Tangent: Dentistry in Canada, wow, what a difference! 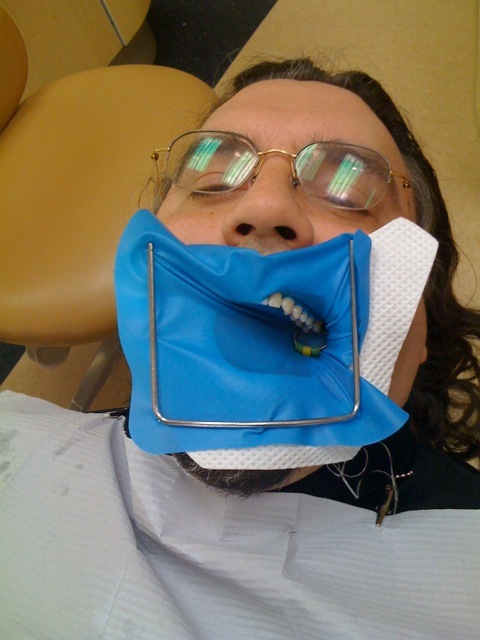 Posted on February 20, 2010 February 20, 2010 by Debito Arudou Ph.D.
and new types of novocaine, ones that don’t look like horse needles going in, were administered. It wasn’t a comfortable experience, to be sure, but it wasn’t painful (I had a tooth pulled at age 7 or 8 — that set me on the straight and narrow when it comes to cleaning my teeth assiduously; five cavities at once were the first fillings I’ve had in about fifteen years.) And all told, I spent about 9 and a half hours in the dentist chair. Boy my mouth feels awful, but my teeth feel good (so good I think I’d rather take my food intravenously for awhile). But why is this a Debito.org issue? Well, tangentially it is, since dentistry I consider to be a very lagging science in Japan (not ten years ago I had to search hard just to find a dentist in Sapporo who would wear gloves! That’s something that sends tremors amongst my overseas dentists when I tell them). Case in point: Just look at the awful bridgework you see in old people around you (and full dentures are not at all uncommon — both my ex-parents in law had them). Some of my students even today come to class with very inflamed sides of their mouth (some meat or seafood stuck in their teeth they just can’t dislodge with the ubiquitous toothpick), and when I recommend floss they say they’ve never even heard of it! I’m told (and I can’t substantiate right now; Debito.org Readers, douzo) that in Japan’s medical exam system, people get licensed for particular practices depending on their scores. The people on the bottom go into dentistry. That rings true to me, anyway. My last teeth cleaning (in Japan) was about five years ago — and it was so bad (the doc wore gloves but a very stained smock) that they gave me an ultrasound (no scaling below the gums afterwards), then a flossing — and snapped the floss on what was left behind. I told them to start again. Cost 3000 yen all told. Got what I paid for. No doubt the black calculus that my dental hygienist scraped out (and proudly showed me a huge fleck of) was missed back then. Ugh. Debito, I concur. I had lots of work done in Osaka by a local guy between 1992 and 1995, all of which just fell out on a regular basis! Small, partial inlays, without foundational support, and done without sufficient pain-killer either. My last trip was to a Hong Kong trained dentist in Sakai-shi, who removed all the previously done and re-done work, and they’re still intact. I mentioned this to a dentist student after all this, and was told, no kidding, that “Japanese dentistry is not suitable for foreign mouths.” Suffice it to say I see only dentists trained for my kind of mouth after that! We’ve had mixed luck with dentists. Our kids LOVE their dentist. Only the middle of the 3 has had anything more than a cleaning done (he has 1 tooth that is “soft” – you can definitely see the difference in the tooth when you brush his teeth since it looks white and chalky rather than pearly and shiny) and even he loved his dentist. That being said after I had a tooth that broke (the middle of the tooth literally broke off leaving a C shaped hole and an exposed nerve in the middle while I was eating some mochi) and went in to see a dentist who proceeded to poke the nerve multiple times with his probe I decided it was less painful to wait 2 weeks and get it fixed on my next trip to the USA (clove oil does wonders to angry nerves if you ever have to deal with something like that). I look at it like we looked at having our kids (2 of the 3 were born in Japan). We had a terrible time finding a doctor who would give my wife an epidural (love her – why experience the pain of childbirth if you don’t have to?) They all viewed it as unnecessary, one actually told her she should be able to handle the pain and didn’t need an epi. It took some searching but eventually we found 2 doctors who had no problem with it. It might be a training thing. It might just be that they’re jerks. Hard to say since if you look hard (or you luck out) you can find good doctors/dentists in Japan. Went to a local butcher who, err…butchered me. It was so bad that a New Zealand dentist (in NZ) took one look in my mouth and said: you’ve been to Japan, haven’t you. A principal cause of gum disease is calculus. This is the hard, chalky material that forms when soft plaque is left in place by inadequate brushing and flossing. Visible calculus is yellow or white, but black calculus also forms underneath the gums. Once started, the process encourages further plaque to form, and the amount and thickness of the calculus steadily increases. GROSS! Do you have chronic bad breath? — Not that I know of. I brush and mouthwash shortly after every meal, sometimes before class. My experience has been disastrous in general. I needed routine cleaning a few years back, and they said I had to come in SIX times! Each time the guy, or actually the assistant, was going to clean three or four teeth. No more. Forget it! Had it done in the USA, all finished in under an hour. Fillings or crowns I had done in Japan were so bad that they always hurt (different dentist from the above) and gums were bleeding. They were all taken out and replaced by an aghast dentist in the USA and have been fine ever since. I could tell you horror stories about experiences by a friend who had lots of root canals done here. Sends shivers up my spine. They were all operated out in the USA some years later, to the tune of 25,000 dollars. But no problem since. In general I find Japanese dentistry is at the level of the third world, thanks to ancient technology, nepotistic practices, bad or no teaching in dental schools, and an insurance system that rewards frequent and useless visits. I’m sure that there are some exceptions, if you really hunt. Just like there are plenty of incompetents in the USA and elsewhere. The problem though, is finding a good dentist. Internet rating sites are utterly useless, and word of mouth and recommendations by Japanese friends are not much better. People here are simply used to the quack-ish procedures and can’t imagine anything else. Buyer beware! The only good thing about it here is that it is cheap. If you stick to the low-grade items insurance covers. Anything else is actually just as much as elsewhere, for uninsured people. I have over $30,000 USD stuck in my mouth. Back in December the cement on one side of my permanent retainer gave out. I need it recemented but I think I will wait until I return to the US to get it fixed. I had my 1/2 fake tooth (rebuilt with cement but wait for crown while other work pended) broke while I was studying abroad here. It was my front tooth so I needed it fixed ASAP. I went to a guy in Roppongi who got his degree in Hawaii. He was okay, and rebuilt my tooth fine, but I would have much rathered had my American dentist who would have done an excellent job instead. Sounds like you’ve been eating at Izakayas too much. They do offer ‘cheap’ food, but the ingredients are shocking. Most cheap places to eat in japan are shockingingly poor quality and bears no relationship with real Japanese food…or even food! They are made full of sugar/mirin and/or salt. I avoid them like the plague. Japanese don’t realise that their healthy cuisine has been taken over by the “convenience” culture that exists in the west. Not surprsing when they, like my wife, work 8am to 11pm daily! Look at any 7/11 or Lawsons…cheap ready made food. Jusco’s etc all the same, but just slightly better….just stick to sushi/sashimi if you buy convenience food from supermarkets!! Everyone is shocked that i make my own dashi stock, fresh everyday, for example. I make most of my own pickles and so on. Oyakadon etc, all a peice of piss to make…It aint hard, just a bit time consuming (but once you have made the dashi stock, many are quick to make), but, just make plenty of stock to last several days. As for dentistry. There is no social welfare here, that’s why. Ergo people only go when reall reall desparate!!. In the UK, where I am from, we had regular check ups every 6months for years, all paid for until i was about 20-ish, when the then Govt. chnaged the rules. Now we pay a bit, not much. Dentists in the UK were poor too in the 70s, but now, excellent. Private ones bloody expensive too! I waited a few months, after my fillings of some 30 years fell out last year, until i went back to the UK. Very quick and excellent job. Not expensive either. My dentist Nakai san is great- friendly, no nonsense, quick PAINLESS and cheap. My prior Japanese dentist, a woman, was great. In fact she saved a tooth rather than just fill it. I’ve only had two dentists in Japan over a total of about 15 years here and these were just local ones, you know, not for gaijin or expats. My wife had an issue with a dentist she used to go with a filling, but she switched to someone in Yotsuya and no problem. I had mixed luck in the UK, but that was going back 20 years ago. Is there supposed to be something wrong with Japanese dentists? In my area lots of good dentists, and lots of bad. Just have to look around. Rule of thumb—go to a young dentist–guys under 40 will give the best and highest tech treatments. I found a dentist in the small town I was living at a few years ago. He is very modern, and often goes to seminars overseas. He cleans the whole mouth, ultrasound scaling, he has top of the line x-ray… , good price. I think i pay about ¥1500 a visit, and that is cleaning the whole mouth. A good dentist, i think. Considering stories i have heard from friends who live in nearby towns, My dentist sounds wonderful. And it is strange that he has his practice in a small town. I have recommended him to many friends. One good friend even had all fillings replaced with white porcelain fillings and now has a nice white smile. I believe there are more good, modern dentists out there. However, finding a good dentist in your area is a challenge. Just like finding a good doctor. It’s all a crap shoot. The only “rule” I’ve found is never go to a dentist that is open on Sundays, offers “free consultation” etc. Basically signs they are desperate for customers. I had to use one because of my schedule after years without a trip 5 fillings and a root canal last year. Of course, each filling was done individualy and each required 3-4 trips. All HIS fillings started to fall out within 6 months, starting with the root canal cap which always hurt anyway. Currently going to a competent dentist, much further away, on weekdays, to replace everything, plus completely remove one tooth that had rotted away, bad fillings seem to be very good at collecting bits of food and making things much worse. The comedy is I had an appointment every 2 weeks or so, and during each 2 week period, another of the quack’s fillings had fallen out. He also does cosmetic dentistry, maybe that’s a good thing? Yet I still had to argue that the quack who did the root canal didn’t actually remove all the nerve, thus my need to pound my fist into a table any time I slip up and drink something hot. Japanese dentistry has meant that I basically can’t enjoy any cold or hot foods, hopefully my new dentist can solve this problem. Or maybe Japan could start FLOURIDATION?!?!?! I suppose the dentists lobby is against it. I have always gone to recommended dentists here in Tokyo and have had good results. The one time I chose the dentist without asking around, I got manhandled and over charged. I have never had anything more than a cleaning done, but I have always been satisfied, and never paid more than 1000 yen. They always tell me to come back every 6 months and have taught me how to properly brush and floss. The one thing that I am surprised they don’t do is: recommend mouthwash like listerine. I have used it religiously since I was around 13 and I have never had a filling. In Canada going to the dentist is not covered through the Canadian National Medical Plan, unless you have a private or company plan which most people do not have in Canada. I am more then happy with the dental care here in Japan, it helps to have a good friend who is a dentist. But one thing I have found here in Japan the dentists are in to much of a rush, the more patients the more money they make this is why the work in Japan is not that good. I would like to know if Japan does the FLOURIDATION of the water like Canada and America. What have I have found is that many Japanese dentists do not update their skills. Therefore getting a young dentist is key, as is someone who goes overseas and to seminars. If they can perform advanced proceedures (implants and the like )they might be current. I go in for a simple treatment, usually a cleaning, and then I give the doctor the third degree. Dentistry is really about the details. If I tell them I have a license and they don’t freak, they maybe a keeper. If they ask you how much money you are willing to spend upfront… run away. Here is a great guy in Nagasaki…. Interesting tangent.As I have perfect teeth (don’t ask me why) I never had more than a clean and polish once every few years while I was in Japan.My wife, on the other hand, being Japanese has had problems with the bone under her gum, the foundation for her teeth slowly melting away-seems to be an ethnic thing.Anyway, long story short when she was in Japan one tooth in particular was wobbly due to the lack of underlying bone and used to get filled with pus due to the empty space.The Japanese dentists she went to would only clean the infection and would make excuses like it would be a waste of a good tooth to remove it etc. When we both emigrated to Australia the first dentist she went to took it out saying it should have been done years ago.Since then she has had no trouble whatsoever.The only reason I can think of is that the Japanese dentists wanted to stretch the treatment out as long as possible for the financial benefit. Lucky are those people who have a lot of choice when it comes to dentists and can find work of acceptable quality. IMO what has happened here is that seniority rules the Dental Association old guys, old methods, old technology, plus the super high cost of upgrading your equipment, dentists graduates goes into big debt to set up a practice and can’t really afford to upgrade their offices. Watch the guys at work juggling 3-4 patients at a time 2 minutes here, 3 minutes at the next patient, 5 minutes, add to that the need to churn the insurance system to be properly paid. Why does the dentist need gloves? How many people are HIV positive in Hokkaido? 1 in 50,000? USA 1 in 150? — There are lots more reasons to wear gloves than just to prevent AIDS. Nongloved hands have fingernails with stuff under them, for starters. In Nagoya my Chinese friend reccomended me a dentist, who, as it turned out, worked with most of my ryuugakusei friends and they all were satisfied with him. I also reccomended him to a foreign student, and she liked him. Compared to my coutry where dentists are mostly expensive butchers with cheap low quality equipment and poor hygiene,the health insurance covers exactly one filling, any other operation you must pay for.You must stand the pain because otherwise the butcher…sorry, the dentist treats you like a sissy. Of course I would love the clean well equipped clinic and the polite, friendly and skillful doctor and nurses.. Before going there in my home country I hated going to dentist and didn’t, especially with these prices.I had a cavity filled before going to Japan and it fell 2 months later.This year when I went back to my country, I had to go 4 times for a simple not very well made filling, while in Japan I needed to go only once. And its much cheaper than in my home country. So yes, I prefer to have my teeth done in Japan. — You’re lucky your J dentist made you come only once for a filling. Reading all the stories here, I’m really, really glad I didn’t chance going to a dentist in Japan. A while back one of my teeth literally broke in half… but when I asked my senpai where to go, she said I’d best wait until I go back to Romania for the summer and see a dentist there. I see what she meant now. The best I found Dr. Naito in Hiroo. He doesn`t accept NHI, but I don`t care I have expat insurance. Often need to wait for appo 3-4 weeks, busy guy. I feel so relaxed there and Dr. Naito knows what he is doing. Usually it takes 1-2 visit and is over. He spends with you 1h, not 3min. My Japanese wife goes there too. We cannot imagine to go elsewhere anymore, after all “sh***” around. When I came to Japan 10 years ago I didn`t know the system. I realized when I had to come back 20 times with one tooth. I screamed to dentist saying what are you F*** think? Left after 18th times and finished somewhere else. Another visit was also 7 times. Dentist played too long with my tooth. My intuition told me to stop him and I listened. I asked dentist what is he doing? He told me we need crown. I said WHAT!!!!! In Europe they cover with white filling and is fine, you see all my teeth? So, you do the same. By the way, how much you want for crown, 7man?! 10man? Answer: Uuuummmm…shhh…7man. Well, I said. Just cover and stop playing and digging up. My tooth is fine till today. I thought paying 100% without NHI abuse will make everything different but it won`t. [epithet deleted]. They are trained to abuse system and make as much money as possible. last time I did an online search there were ‘absolutely no double blind studies that proved that infection rates dropped with the use of antiseptic gel’ Infection rates do drop with washing your hands with hot water and soap (especially so with anti-bacterial and antiseptic soaps). Massively so! They have clean hands weeks in NA! How many times do schools or classes get closed in NA compared to Japan? The points I’m trying to make (thank you John K.for the help) we want to do things because they lead to ‘proven’ better health outcomes. Not because a soap antiseptic gel company has convinced the public or the public has convinced itself to buy their product. Do the masks people wear in Japan prevent infections or the transmission of colds, viruses and infectious bacteria? Whether or not gloves are proven to lead to better health outcomes for all work done in dental offices or for any work done there; the North American public demands gloves. No dentist would have patients if they didn’t use gloves. I don’t believe a dentist could get malpractice insurance either. IMO if all dentists in Japan wore gloves all the time it would not lead to better dental practice, better dental health outcomes, and significantly fewer post procedure infections. Retiring( I was going to say shoot) the geriatrics who control the services offered by J dentists, and retire the bureaucrats who set the insurance fees paid to them for work done. Opening up the inputs dentists buy to do dentistry to competitive suppliers. Improving patient knowledge, requiring dentists to attend upgrading classes, making dentists ask permission before commencing treatment, making dentists communicate and use micro cameras. Making dentists publicize what they do, how they do it and what they charge. Allowing the public to get various types of insurance and dentists to set alternative treatment and fees. Making the current National health insurance schemes cover alternative treatment and preventative dentistry. Fluoridating water and teeth. All of these listed above would have much larger benefits to dental health outcomes than gloves. IMO talking about gloves only delays the real changes that are required for things to get better. Would I like my J dentist to do a lot of things differently, yes. Do I care that he doesn’t use gloves since I’ve watched how thoroughly he washes his hands, no. The use of gels etc, have proven to be ‘clinically’ effective in studies in the UK and Holland, for the prevention of spreading MRSA. — Need links to substantiate claims of mask time limits. This is out of topic but I take exception to Mark in Kanto’s assertion that Japanese dentists are as bad as so-called Third World dentists. Those dentists may be practicing in poorer countries but it does not necessarily mean that they are ill-trained. Has he ever tried getting any dental work in a Third World country to make that kind of conclusion? A little sensitivity and reflection, please. Had 14 teeth worked on at a local dentist about 5 years ago, and the whole experience was cheap, pain free (only used an anaesthetic once, despite performing a root canal, a reconstruction, and adding 7 crowns) and high quality. I’d put off going to the dentist for years after my many awful experiences at British butchers (hence the extensive treatment needed), but now I find the whole experience perfectly pleasant, and I often leave in a better mood than when I go in. Maybe I just got lucky and found a good one, but it’s not in a high population area or anything. I can think of a couple of excellent dentists in the Tokyo area. I can fully vouch for both of them. They are just wonderful dentists. My dentist is awesome. He’s called Iwanaga and he has his own practice in Shinjuku where his Dad had a practie years before. He has no need to work to meet financial needs and does it for the love of it. but get a reccomendation or even better get it done back home then you won’t be able to blame it on Japan. I’ve had serious dental problems off and on since I crashed a car and lost a number of teeth in the process, back in 1972. I was fortunate to have a very good dentist do all the restoration work at that time, including a permanent bridge. Well, permanent in this case means about 20 years. Sure enough, nearly 20 years to the month, my bridge began to come loose. At that time I was living in Osaka and had national health insurance. A friend recommended a dentist and to be perfectly honest I was terrified at the thought of visiting him. Some of this fear stems from the fact that I had experienced panic attacks for the first time a year earlier. I made it to the office and was surprised to find a row of five chairs fairly close together with no partitions between them. A seemingly regular occurrence in Japan but an unusual and uncomfortable experience for me. I spoke with the doctor and noticed that there were two tanks on nitrous oxide against the wall. They had a pretty thick layer of dust covering them. I explained that when I had the original restoration work done the dentist used nitrous oxide along with injections of anesthesia. Well, this dentist said that it would be impossible to use the gas. No reason give. After about 15 minutes of activity, I told him to please stop and I left, preferring a loose bridge to the treatment I was receiving. A few years later I had a very bad tooth, a back molar I believe, and had to go to a dentist. I visited a clinic recommended by a Japanese friend who was a dental supply salesman. I thought that taro should know where I should go. Mistake! After a brief examination, again in a room with a number of patients being treated at once, I was informed that I would need to have the tooth extracted. I had no problem with that since my main concern was relief of the pain I had been experiencing. After the first injection of a local anesthesia one doctor tried to pull the tooth. Nothing! Only more intense pain. Another injection followed buy another session of yanking on my tooth with no success. After about five injections, the last few I firmly believe contained no anesthesia (placebo), and three different dentists straddling me while attempting to gain leverage to remove the tooth, I left the office just as I had arrived with the painful tooth still in my mouth. When I arrived in Okayama a year or two later I had severe pain again and visited Okayama University Dental Hospital. What a completely different experience. I was assigned to one doctor who had studied at New York University and another who had been at the University of Michigan. They were both accustomed to the needs of American patients (pain killers, not zen techniques at endurance and explanations of procedures. Well the one dentist has moved on and the other has been promoted so he no longer treats patients on a regular basis, yet all those who have treated me since have been very professional and competent. I can put up with multiple visits knowing that I am receiving quality care. I have even fallen asleep during root canal procedure on two occasions. This was no doubt due to the confidence I had in the doctor and his chairside manner. I guess the bottom line of this long-winded post is that it is not the country per se, but the individual who provides the service that counts most. As an expat American I feel a need to add that the cost of my treatments has been relatively inexpensive compared to any treatment in the states. In the past two weeks I had four roots removed (one two-hour session) and a new removable denture fitted for a total cost of about $75. To be honest, I think that if I relocated in Japan I’d return to Okayama for future treatment. I get my teeth cleaned here once-twice annually and that’s it. I have had some minor repairwork done in Bangkok (they don’t dilly-dally and make you come back after a week for a stupid filling!) and I will go there for more work in the future, should I need it. Even without insurance it is very reasonable. When first arrived to Japan, I found out that I had dental insurance. Decided to get rid of all my old mercury filling. Heard that the mercury in your mouth is dangerous and wanted to swap them with plastic. Had about eight or nine mercury fillings swapped. Went to a large and well known dental hospital in Fukushima once a week, and it took a few weeks to swap them all out. Anyway, after done, most or all of the replacements fell out within three years. Had to get them redone. Not fun. That said, still glad to get rid of that darm mercury. Looking at Japanese teeth, it pretty clear that Japanese dentistry is overall really pretty bad. Cannot fathom why with all the expensive crap one can buy here, that dental care not paramount. My dentist here is very good. However he is a Japanese educated at both Japanese and US dental schools. He is the only one (of 4 I have seen here) who doesn’t instist on removing all my old US amalgam fillings and replace them with new ones. When I first got here, I used a dentist who did not take health insurance. Excellent care, but costly. Now, I have a dentist who takes health insurance and was trained in the US, speaks English, and is westernized. Excellent care. — Care to share his name and place of practice?